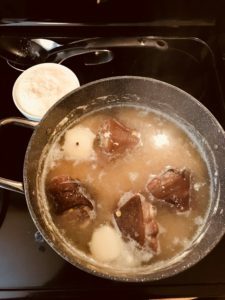 My Scot/Scots-Irish/Anglo-Irish/Alsatian-American mother would make this soup to honor my father's Swedish heritage, using the bone and some of the left over meat from a roast ham, typically from some family gathering the day before. I always liked this soup even better than the roast ham itself. 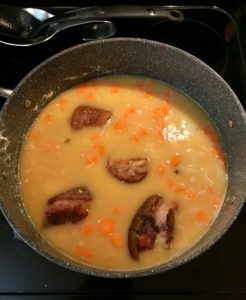 My mother used yellow split peas for this soup. 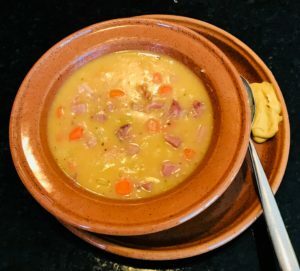 For St. Patrick's Day, I plan to make the French version of this soup, called Potâge St. Germain, which is sometimes made with green split peas (that's the way Magic Pan used to do it), but more often with fresh or frozen peas. 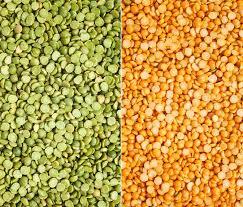 Swedes always use yellow split peas. I remember driving with our family on road trips around California when we would see those signs advertising how far away we were from Andersen's Split Pea Soup Restaurant. "Aw, they use green split peas!" one of us would scoff in a superior tone. 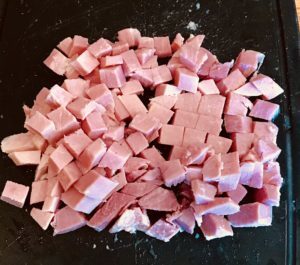 I watched my mother make this from the time I could barely tug on her apron strings (she put me up on a stool so I could watch what she was doing), and I think this recipe captures pretty well how she made it, only substituting ham hocks and a slice of ham for the leftover ham bone and ham. I think I got it online somewhere when I was working on the second addition of Kip and Marilyn's Favorite Recipes. The addition of mustard as a garnish at the end is not something we did, but it is traditional in Sweden and adds a nice contrast. You dip your spoon first in the mustard, then in the soup. 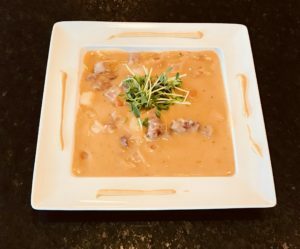 This soup will really stick to your ribs, perfect for this snowy day in Connecticut. Add salt, onion, ham hocks and bay leaf. 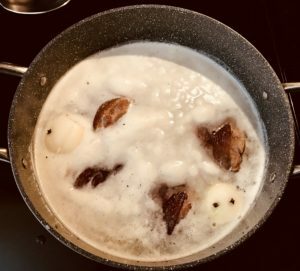 Bring to boil, cover and reduce heat to simmer 1 to 1 1/2 hours or until all is tender, stirring carefully once or twice toward the end of cooking to prevent scorching. 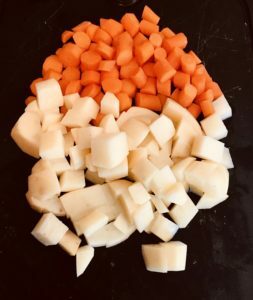 Add carrots and potatoes in last 1/2 hour of cooking. Discard onion with cloves (if you can find the onion). Add more water if soup is too thick (or if it looks like it may be too thin, leave the pot uncovered for the last half-hour of simmering, which is what I did). 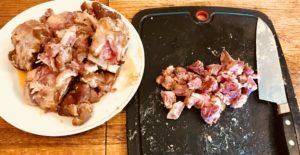 Remove ham hocks; cut off meat and dice small. Discard skin and bones. Add meat from hocks and ham to soup; season with marjoram and pepper. 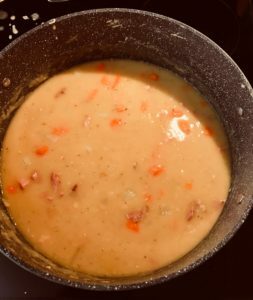 Heat through and serve with prepared mustard on the rim of the soup plate. I love the skinny carrots I found in the organic section at Stop and Shop. They make beautiful little round chunks in the soup. 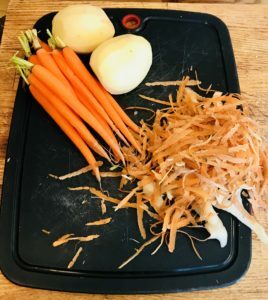 NOTE: when you add the potatoes and carrots to the soup, it will cool it down, so you'll have to increase the heat to return it to a boil, then turn it down again for its last half-hour simmer. Oh so good. I highly recommend the Swedish practice of dipping your spoon in the mustard before taking a spoonful of the soup. Adds just the right punch. Only wish my sister Robin and brother Peter were here to have it with me! The sun came out and it's a balmy 42 degrees outside. 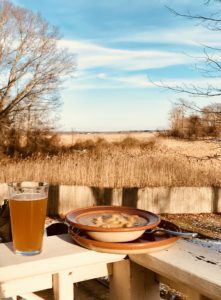 So I had a second bowl for supper on the deck with a "Belgian IPA" from 30 Mile Brewing Company. I walked over there just now with my empty half-gallon growler to see what they had on tap today that I could fill it with (that's how they sell their beer). I thought the citrusy bitterness of this on-the-light-side IPA would cut through the heaviness of the soup. It did. 30 Mile Brewery is about a half-mile from my house. One of my definitions of a civilized place is that you can walk to a microbrewery from your house. I've got the Neil Young station on Amazon Music playing on the UE. Right now "Do It Again" by Steely Dan is up. Seems appropriate for a second bowl of soup! Dijon mustard on the rim of the bowl. The greens are pea shoots, which go especially well with this pea soup. Sophisticated. Worthy of that glass slipper. *I caught a bit of the Faith Middleton show last week when she and her guests were discussing whether adding just one bay leaf to a dish actually does anything flavor-wise. Tend to agree with them that it doesn't, so I added two, maybe even three bay leaves to this soup. I think that's what my mother did too. Speaking of bay leaves, when I was at UCSC, I liked to explore around in the local history archive and I still remember this bit of purple prose from a late 19th century tourism brochure: "....the towering redwoods, redolent of resinous balsams, and the world renown bay tree, with its camphorated aromatic fragrance..." So over-the-top that it has stuck in my memory 45 years later. You’re going to love it. Will put you right back to our childhood. Recommend an IPA to go with. See what I added just now to the original blog. of info. I’m happy that you simply shared this helpful info with us. Hi there to every , for the reason that I am genuinely keen of reading this blog’s post to be updated regularly. I designed it myself using Managed Word Press through GoDaddy. An outstanding share! I have just forwarded this onto a friend who was conducting a little research on this. And he actually bought me breakfast because I found it for him… lol. So let me reword this…. Thanks for the meal!! But yeah, thanx for spending the time to talk about this matter here on your internet site.